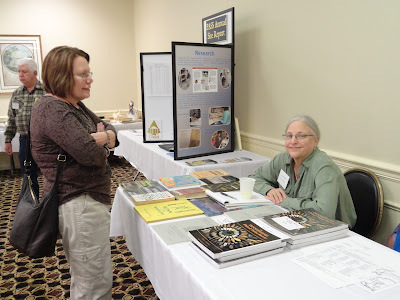 This week in Pennsylvania Archaeology features a summary of the joint Pennsylvania Archaeological Council (PAC) and Society for Pennsylvania Archaeology, Inc. (SPA) annual meetings at West Middlesex, Mercer County on 4/15-4/17/2016. The gathering of professional and amateur archaeologists began Friday morning with the PAC business meeting. Here a variety of issues facing archaeology in the Commonwealth were discussed, foremost among these was the new predictive model for pre-contact sites that is now available on the Cultural Resources Geographic Information System (CRGIS) website. New guidelines issued by the State Historic Preservation Office (SHPO) created quite a stir but a closer examination revealed these were a clarification rather than significant changes (although the discussion is still on-going). In the afternoon, PAC held a symposium entitled Lithic Quarries in Pennsylvania: The Archaeology of Tool Stone Procurement. Frank Vento began the presentation with an overview of the geologic formation of the main types of stone used in the production of chipped stone tools. Chert is the most common type used in the region and it is found in several different geologic formations including Bowmanstown, Shriver, Buttermilk Falls, Monongahela, Upper Mercer and Van Port. These overlap in color and appearance but several can be distinguished by the microscopic examination of thin-sections. Kurt Carr presented an overview of recorded prehistoric quarry sites including how the material was extracted from the ground. Quartz and quartzite were collected directly from the surface with minimal effort, however, shallow mining pits, one to three meters deep were dug to recover argillite and metarhyolite. The Hardyston jasper quarries in the Allentown area required the most effort. Mining pits over eight meters deep were dug to extract jasper for tools. Digging the pit took place over thousands of years, but, as noted by Brian Fritz, managing the spoils pile was the major problem. Ken Burkett, Paul Raber, Bev Chiarulli and Tim Murtha discussed specific quarries and also described the lithic reduction sites around these quarries. Typically, the raw material is frequently located some distance from water and once it was removed from the bedrock, the best pieces were moved to a more comfortable site where the poor quality material was removed and the actual production of tools began. Heather Wholey described the quarrying process for steatite which is a relatively soft rock that was used for stone bowls and ornaments during the Transitional period. Although, numerous studies have been conducted of the steatite quarries, Heather’s investigation included one of the first modern archaeological excavations of a worked outcrop. Brian Fritz finished the session with a model for the analysis of quarry sites. It included a classification system for quarry site types and new methods for analyzing large quantities of quarry debris. The SPA paper presentations began Saturday morning with a special treat for the audience; a video by Angela Jaillet-Wentling entitled Digging Deeper: Buried Landscapes of Pennsylvania. This is a Making Archaeology Public (MAP) https://vimeo.com/153555041 project sponsored by the Advisory Council on Historic Preservation. This is a nation-wide celebration of the 50th anniversary of the National Historic Preservation Act. Although, an unprecedented level of archaeology has been conducted over the past 50 years, much of it has not reached the general public. The goal of the MAP program is for each state to produce a 20 minute video summarizing what has been learned as a result of the NHPS. The basic idea of the MAP Project is that archaeologists within each state will work together to answer the question: What are the most important insights into life in the past that we have gained from National Historic Preservation Act mandated archaeology? Digging Deeper reviews the major stratified sites in each of the major rivers of Pennsylvania that have made significant contributions to our understanding of past cultural behavior. This is a must see. The Saturday morning session continued with presentations on a remote sensing project of Hanna’s Town by David Breitkreutz. Hanna’s Town is an 18th century town in Westmoreland County that has been difficult to locate but this investigation had promising results. Chris Espenshade conducted a battlefield archaeology project involving the Brodhead Expedition of 1779 during the Revolutionary War. His presentation demonstrated the difficulties of documenting a battle that included less than 50 combatants lasting less than an hour. 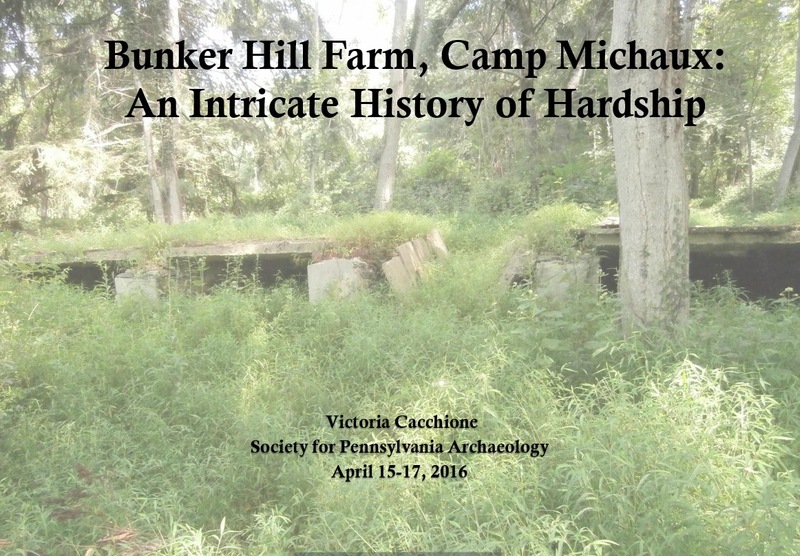 Victoria Cacchione also addressed the difficulties of investigating an historic site located in Michaux State Forest, but in this case, the site was occupied for nearly 200 years. The problem was linking the non-diagnostic artifacts with specific occupations. Charles Williams conducted an industrial archaeology project of the history and eventual demolition of a reservoir dam in Clarion County. The last three papers of the morning had a Paleoindian theme. Tom Glover described the environment, especially temperatures, during the Late Glacial Maximum; the bottom line - it was very very cold. Jim Wosochlo conducted experiments using end and side scrapers on a large cow bone. These tools are ubiquitous on Paleoindian sites and he suggested they were used for working bone, especially for removing the marrow. Finally, Jen Rankin reported on the excavation of a stratified Paleoindian site just across the Delaware River in New Jersey. These types of sites are very rare and preliminary findings suggest a very significant site in terms of the data available from this time period. The afternoon commenced with a poster session by students from Indiana, Kutztown, Millersville, and California universities of Pennsylvania. The topics included a public outreach project, an industrial archaeology project, a distributional analysis of artifacts from a prehistoric village site and a dental analysis documenting gender related differences in an early Monongahela population. The afternoon papers began with a paper by Andy Myers and Patty Stahlman documenting a stone mortar from a rockshelter and included a discussion of the possibility of nuts being processed. Carl Burkett, Robert Ilisevich and Bill Black documented the incredible variety of prehistoric archaeological sites found around Pymatuning Swamp. This type of survey is very important because it documents the diversity of adaptations associated with large wetlands. Ingram et al. conducted an investigation of an artifact collection from a Monongahela site that was investigated several decades ago. They examined the horizontal distribution of a variety of different artifact types. Part of the study included digitizing the site records and inventory notes. This will facilitate future analysis of artifact patterning. The final sessions of the afternoon began with a presentation by Brian Fritz, Bill Tippins and Ken Fisher on the Buffalo Creek Chert of Washington County. This was followed by James Burke who converted old photographs, slides and negatives to electronic media from the Carnegie Museum to reveal “hidden knowledge” concerning early investigation, such as, the Burgwin Mound excavation of 1898. Finally, Dave Watters discussed the contribution of the Thomas Harper archaeological collection at the Carnegie and Amanda Valko, Janet Johnson, Brian Fritz and Bob Oshnock offered a tribute to Fred Veigh who recently passed on but donated his collection to the State Museum of Pennsylvania in perpetuity. It is good that these collections have found a permanent home where they will continue to contribute to exhibits and future research. The goal of the SPA and PAC annual meetings is to share information on recent research being conducted by amateurs, professionals and students (our next generation of researchers). This year’s meetings were definitely successful in reaching that goal. Sharing research conducted by avocational and professional archaeologists is important for both groups. The opportunity to hear of sites that the professional community is investigating and the potential for detailed analysis allows for SPA Chapters to learn about current excavation methods. We hope you will consider attending next year’s meeting in Harrisburg, April 7-9, 2017. It’s that time of year again! Next weekend, April 15 – 17, 2016 marks the Society for Pennsylvania Archaeology’s (SPA) 87th annual meeting. This year’s meeting will be hosted by the Ohio Valley Chapter of the SPA (#22) in West Middlesex, PA. The theme of the conference is Digging Down into Pennsylvania’s Past: Pre-Clovis through Postmodern. 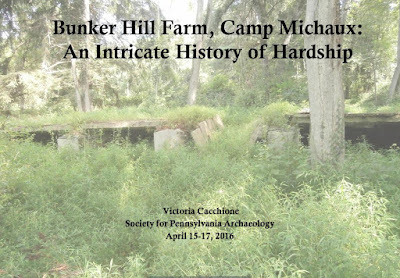 As always, this year’s meeting promises to be enlightening and informative, spanning a wide range of archaeological topics in the Keystone State. Friday afternoon, The Pennsylvania Archaeological Council will hold a symposium on Lithic Quarries in Pennsylvania: The Archaeology of Tool Stone Procurement, highlighting the state’s lithic resources and their use by its prehistoric inhabitants. Papers will be presented by some of the state’s prominent archaeologists including The State Museum of Pennsylvania’s own Dr. Kurt Carr, who will speak on bedrock quarries and their uses and distribution based on his own field research and the records of the Pennsylvania Archaeological Site Survey files. Other papers will focus on the different types of geological sources available in the state. The meeting, being held at the Park Inn by Radisson in West Middlesex is open to the public. Registration at the door is $35 and the cost for dinner is $32. The SPA is listed as one of our “favorite links” on the right hand side of the screen. For more information and for the entire program including abstracts click the link to their homepage. Presentations throughout the weekend will highlight research by students and avocational and professional archaeologists. Students vie for the Dr. James Hatch and Dr. W. Fred Kinsey scholarships by submitting papers on Pennsylvania archaeology. These student scholarships support and recognize the efforts of the next generation of archaeologists who will continue to support the activities of the Society. 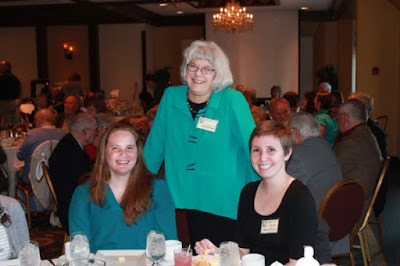 With the assistance of State Museum staff, recipients of the Kinsey Scholarship have an opportunity to get their paper published in the Society’s journal, Pennsylvania Archaeologist. Saturday evening will feature the banquet, a guest speaker and awards ceremony, followed by the ever-popular live auction. The keynote speaker will be Dr. Aksel Casson, Assistant Professor of Anthropology at Slippery Rock University and Co-Director of the Middle East Studies Center. Dr. Casson will be speaking on the Destruction of Cultural Heritage in Syria: Thinking Globally and Locally; a timely topic in view of the recent damage leveled by ISIS in the ancient city of Palmyra and other places across the country. The auction is an exciting SPA tradition so be sure to bring a few extra bucks to bid on books, archaeological field equipment, and gift baskets. Money raised will go to benefit the Elmer Erb Permanent Fund. Also, be sure to visit the bookroom and student poster session throughout the day on both Friday and Saturday. Activities wrap up Saturday night with refreshments and mingling in the Hospitality Suite.